Join your Country Club Manor neighbors in Rochester, MN in honoring the freedoms that the American Flag represents. Be part of a beautiful display of red, white and blue in your neighborhood and support our Scouts in their fund raising efforts. Troop 99 will store your flag when not in use. 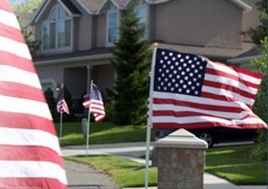 Your flag will be placed within a foot of where your driveway meets the sidewalk. A $50 donation will be collected by the Scout that sells you the subscription. Renew for $25.00!! “Flags Across America” is a Troop fund raising program where a Scout can help pay for his scouting experience while providing a patriotic tribute to America. To get started today, please fill out the form below with your contact information and we’ll dispatch a Scout to your home to sign up.